Weighty Matters: Dietitians of Canada opposed to calories on menus? Dietitians of Canada opposed to calories on menus? I would have thought it's pretty much a no-brainer for any one who cared about nutrition and heath. I mean who could possibly have a problem with providing consumers with information that might help them make better dietary decisions? The information isn't meant to be judgemental. It's not meant to teach people that calories are bad any more than price tags are meant to teach people that dollars are bad. It's just there to help allow consumers to actually make informed choices. So who's come out vocally in favour of calorie labeling? So who else wants calories on menus? The public. Polls have consistently placed public support of mandatory calories posting on menus at around 80%. The food industry. Recently in the United States the National Restaurant Association has joined hands with lawmakers to support the passing of a federal bill that would mandate chain restaurants post menu board calories in every single chain restaurant across their country. So who doesn't want calories on menus? 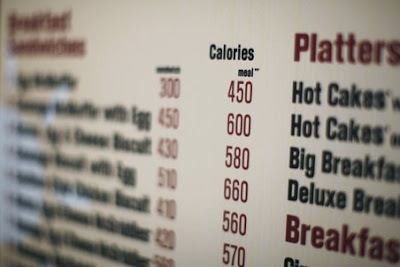 Posting of caloric information on menu boards or through a tag attached to individual food items is being proposed through a bill introduced in the Ontario legislature by Frances Gelinas, MPP and NDP Critic for Health. The proposed bill would apply to foodservice operations with annual revenues greater than $5 million, and non-compliance would be fined. The bill also proposes limits on artificial trans fats. Dietitians of Canada is concerned that there is limited evidence to support a move to posting energy content of foods on restaurant menu boards as a means of influencing consumers to make positive changes in their food selection at this point of purchase. We are interested in identifying your views on this issue as well as identifying relevant evidence to support your views. Your input will help shape the DC response to this issue. Please take a few moments to complete this brief survey. The survey should take no more than 5 - 10 minutes to complete. Your response by April 17 is appreciated. Linda Dietrich, Regional Executive Director Central and Southern Ontario"
So just to put this in perspective - nutrition advocacy and professional organizations (including the American Dietetic Association - the DC's American counterpart) support mandatory menu labeling, medical organizations support mandatory menu labeling, non-profit health groups support mandatory menu labeling, the public supports menu labeling, even Big Food supports mandatory menu labeling and the Dietitians of Canada have concerns? What could they possibly be concerned about? They talk of a lack of evidence, but yet there's ample evidence that menu board calories are both an important need and a great idea. But really, even if there wasn't yet ample evidence, what possible reason could DC have to deny Canadians the ability to make more thoughtful dietary decisions by ensuring restaurants provide them with more information? Does DC feel that the calorie section on nutrition facts panels should be removed as well? Dietitians out there? Do you have any thoughts as to what the Dietitians of Canada might be afraid of and why they seem to be having more difficulty assessing the evidence base than even the food industry? UPDATE: Thanks to RD who in the comments posted the results of the incredibly skewed survey (meaning if you prime your members by telling them the organization "has concerns" go figure people aren't going to support the concern in question). So unbelievably only 47% of Canadian dietitians who participated in the survey felt that posting calorie information on menus is an effective means of public education and modifying food choices. Even more unbelievably only 71% of Canadian dietitians who participated in the survey felt that trans-fats should be banned. If I were a Canadian dietitian, I'd be absolutely mortified.